When fully charged, will stay frozen for 36 hours. Needs to be plugged in prior to delivery to maintain cold temperature. Includes lid lock, handle bar, heavy duty rubber caster wheels (two swivel & two rigid), cord wrap, & umbrella bracket. Great holding temperatures for pre-packaged frozen items. Must be transported in upright position. 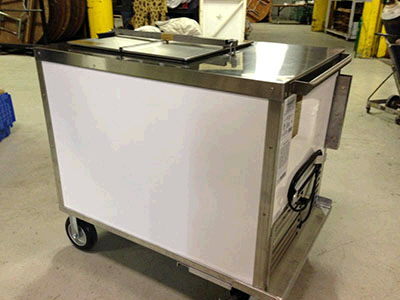 * Please call us for any questions on our ice cream freezer 31 x 42 x 40 inch t rentals in Ft. Wayne IN, Warsaw, Syracuse, Auburn, South Bend, Indianapolis IN.